What Are Meta Titles and Why They Are Important? 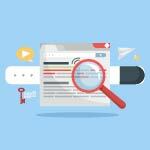 First, let’s start with meta tags and what they do to help your website. Meta tags are key components of a website that tell search engines what the website/page is about. It’s the first part of the website that gets recognized by all search engines. 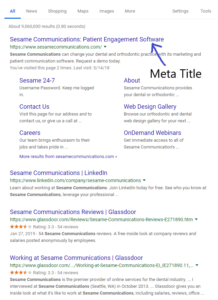 You’ve probably also heard of terms like meta titles (which we will talk about shortly), meta descriptions, and meta keywords. Meta tags have been a staple and one of the most basic fundamentals of search engine optimization. As algorithms have improved and gotten smarter, Google took meta tags out of the ranking factor but it doesn’t mean that they’re not important anymore. What are meta titles then? A meta title is a website element that is required on all pages and defines what that page is about. One place you may recognize the title tag is on the search results page just above the URL. It also appears on the tab of your favorite web browser. This gives the user a quick insight into what kind of content this page might contain and how it might be relevant to their search query. It is often paired with the meta description, which is directly below the meta title. Title tags generally need to be less than 70 characters so Google doesn’t cut out any part of them. Every page on your website should contain a unique title tag. Know what your main keywords are and place them closer to the start of the tag i.e. (Cosmetic Dentist in Seattle). Avoid spamming your titles with duplicate or unnecessary words. Make sure to include your practice name and location in every page. Take your time creating each title tag and put your feet in the searcher’s shoes. Create titles that are targeted at your customers and what they are searching for to achieve the best results. For more information on meta tags and how they are important for your website, feel free to contact the SEO Team! Sesame is an industry leader in integrated, cloud-based marketing and patient-engagement solution designed exclusively for your practice. We know that effective patient communication is vital to the success of your practice and the efficiency of your team. With Ortho Sesame, you can take your practice to the next level, allowing you to concentrate on what’s really important – your patients! © 2018 Sesame Communications, Inc. All rights reserved.